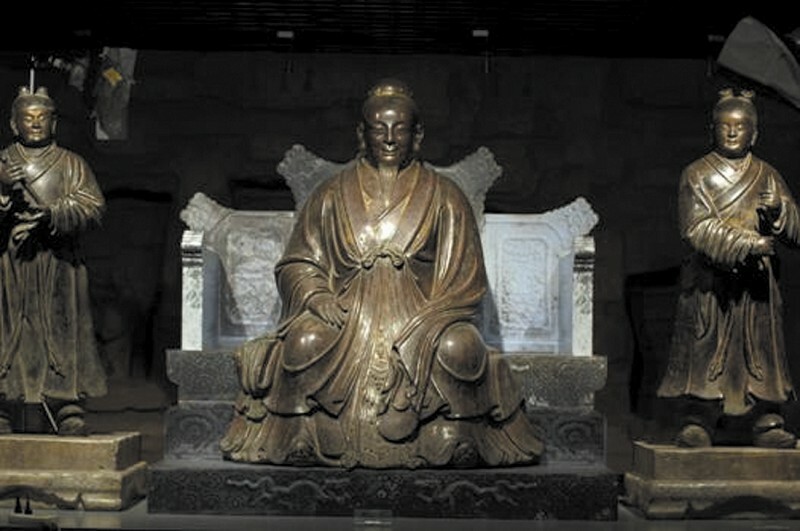 Master Zhang San Feng (张三丰）describes cultivation and Internal Alchemy. Among other writings of ZhangSanFeng, this article of about three thousands three hundred words provides a brief yet clear overview of the pathway of Dao cultivation via meditation and Internal Alchemy. It discusses the general outline of different stages of Daoist cultivation, structure of the human essence-energy-spirit system, important explanation on key concepts such as truth, nature, spirit, mind, foundation practices in breathing and meditation, and barriers and useful attitudes to facilitate the practice. As the master said, practice proceeded blindly leads one to go nowhere (section 16). This article therefore helps practitioner to focus their efforts on the core and direct pathway towards the Dao. Those pursuing the Dao, need to know the three stages and three gates. To sum up in four sentences: “after non-doing, follow by doing; after doing, back to non-doing”. In Internal Alchemy there are also three stages, accumulating the essence and chi is the first stage, opening and closing passages is the second stage, building the foundation and refine the self is the third stage. “I-Ching Annex” said, “Explore and understand the truth and the source of life, and then to life”, this describes stages of Daoist cultivation. What is exploring the truth? Read the authentic teachings, explore the authentic pathways, observe the transformation of the universe, explore the Horse Diagram and the Turtle Diagram, retain the chi during leisure times, keep the spirit (from scattering) to build the foundation. Explore the truth together with the source of life, and you will get the unbeatable body, and to pursue the medicine to last forever. Source of life means internal, life means external, connect the internal to the external as one, and arrive at the great Dao. The three words “and then to” describes the process of returning to innate life from the acquired life, there is no need to look for further formula within. “Condense the spirit and regulate the breath, regulate the breath and condense the spirit” is the first step to proceed. Do these two together, in stages, and without interruption. Condense the spirit, means collecting one’s purified mind to enter into the inside. When the mind is not yet purified, don’t close the eyes, first encourage the mind to come back, be cool and indifferent, then bring the mind to the energy center, this is called condensing the spirit. When the spirit is condensed, it is like sitting on top of a tall mountain and looking at the mountains and waters, like putting up a sky lamp lighting up every darkness and obscurity, this is the meaning of condensing the spirit on emptiness. Regulating the breath is not difficult, when the mind-spirit is quiet, following the breath naturally, i only abide in the naturalness, this when combined with spirit lighting downward, is what means by regulating the breath. Regulating the breath, means mixing YinQiao Chi with mind’s chi in chi center. Condensing the mind under the naval is called condensing the spirit, returning the chi under the naval is called regulating the breath. When spirit leans with breath, abide in natural cleanliness is called “not forgetting”, allow for natural cleanliness is called “not assisting”. Not forgetting and not assisting use silence and softness, breath is active and mind at ease. See nothingness as the place to keep the mind, see dim silence as home for breath and spirit, again and again, purify and purify, all of a sudden spirit and breathe both forgotten, spirit and energy fused. The Yang suddenly arise like one is drunk. True appearing and disappearing, happens when the mystical gate is realized. In scriptures what named as “innate”, “real”, “original” arise from the Yin-Yang furnace, from the dark-unconscious-silence, like one appear from obscurity, you can use this to read Internal Alchemy scriptures. Dao is difficult to learn, and so is teaching the Dao. The teacher is diligent, are the student lazy? The teacher can bear the trouble, can the student endure? Learn not thoroughly, practise not diligently, and mind is not pure, spirit is not real, if approach the Dao with these, not one in ten-thousand succeed. Confucius said “To know this mechanism, is via the spirit”. He did not say via one’s intention, but via the spirit, we can see this subtle appearing and disappearing can only be known via the spirit. Now classify this as “mechanism moves slightly, the straight-forward is straight. To know the mechanism, one can never succeed via the mind, intent, and thought. This is mystical! Spirit need to be the real spirit, to be called innate. Real spirit is, real thought, real mind, real intent. How to differentiate? Teachings said: “fire started in the mystical gate, awake the obscure darkness, the consciousness is it. Alchemist said: “one thought arise from completeness”, is real spirit, the real mind. Other said: “In mist, light of the mind is found”, is real spirit, the real intent. Other said: “In stillness arise wisdom, one’s intent circulates”, is real spirit, real intent. Real spirit never arise from refining the spirit, student should know this. Those learning the Dao have to break the habit they have developed throughout their lives, and lead their minds into the truth, let go of the hot mind and the cool mind appears, surrender the human mind and the Dao mind seen. This is reason for letting go attachment to fame, gain, family and society. Those who are sincere about learning the Dao, have to treat the Dao as precious in one’s life, for the endeavor to succeed. The most important task in pursuing the great Dao is to master the mind and to refine the nature. The nature is within the mind, the mind embrace the nature from outside. Therefore nature is the master of the truth, mind is the building that house the nature. Master the mind means, preserve it; refine the nature means, nurture it. Nurturing the nature means, water the plants within, so the internal medicine become complete, this is refining the nature. When the mind become clear, the nature become tranquil, one not disturbed by sentiments and desires, has no thinking and no concerns, mind and nature at ease inside out, no trouble, these are the effect of mastering the mind and refining the nature, this is Internal Alchemy. People learn the Dao for few months, and do not see any progress, because they were not sincere. If they focus in Dao, their mind naturally have nothing; if their mind were sincere in Dao, they naturally treat things lightly; if their minds were intense in Dao, they naturally become indifferent to things. Hide the mind in deep, keep the spirit from wandering out, when the mind is attached to things, fire moves within. When fire moves within, essence is shaken. Mind is quiet and breath is regulated, quiet long and mind become still. Die the acquired mind to nurture energy, turn off the thinking mind to pure the mind. Essence, energy, spirit are the internal three treasures, ear, eyes, mouth are the external three treasures, keep the internal three treasures from wandering in chasing things, keep the external three treasures from disturbing the inside, breath continuously and deep into the energy center. Let breathing become husband and wife, spirit and energy become mother and son, son-mother husband-wife, gather and not apart, therefore mind does not run outside, intent does not think outside, spirit does not travel outside, essence does not move recklessly, and stream the limbs at all times, this is the authentic Golden Elixir and Great Dao. The Great Dao can be entered via the word “Center”, what is called “Center”, one is of the body, one is not of the body (non-body). Second find the non-body center, Confucius’ <> said: “Center is prior to the uprising of happy, angry, sad, joy”, at this moment, there is no hearing and no seeing, thieves are cautious, hidden and alone, and naturally the nature becomes still and the spirit becomes clear, spirit becomes clear and energy becomes pure, to here one starts to see one’s original face, this seeking is not within the body. Use the center of the body, to pursue the center not of the body, and desire will become easy to purify, heaven’s nature will return to order, saints immortals and buddhas throughout the history, had used this as the first step practise. During meditation, the most important is to condense the spirit and regulate the breath, use calmness to bring back order, refrain from assisting and forgetting, none will not gain kungfu by day. Condensing the spirit and regulating the breath, only need flat mind and harmonized energy. When mind is flatten spirit is condensed, when energy is harmonized breath is regulated. The word “flatten” is wonderful, when no wave arise in the mind it is flatten, mind abide in it is called flat, flat is in the center. When the mind is in it, there is no wave. Ancient immortal said: “Regulate the real breath, refine the non-spirit spirit” Real breath is the breath when the breath stops; non-spirit spirit is the spirit of the spirit. To sum up one need to empty the human mind, embrace the Dao mind, return this Dao mind back to emptiness, dark and silence, save in the center, and one can nurture the real breath, obtain the non-spirit spirit. Beginners should start from internal breathing, this breathing, is like going back to embryo after departing from father and mother. When people can practice this (internal breathing), they breath with their mother like they were embryo, just like they are starting a new life. When meditate, embrace energy with spirit, tie the breath with intent, mild and melodiously accumulate them in the lower energy center without being scattered, so internal energy can mix and fuse with external energy in the lower energy center. Energy eventually builds up, reaches four limbs, flows in meridians, opens the spinal energy gates, flows into the upper energy center, back down to middle energy center, and down to lower energy center. Spirit abides with energy continuously in each breath, and the energy pathway is opened. When practice reach this stage, the foundation is half built, remember to practice diligently and emptily. Regulate the acquired breathing, let it regulate itself, in order to regulate the innate breathing, one only need to reach to emptiness and abide in stillness in the process. When the real breath moves, the mysterious gate is not far. Based on this method, the foundation could be built quickly, not necessarily require one hundred days. “Reach the end of emptiness, abide in the end of stillness”, can be explained generally or separately. Generally speaking, it refers to the method to enter stillness. Separately speaking, emptiness refers to nothingness, end refers to the ultimate center, stillness refers to quiet peacefulness, end refers to concentration. It is equivalent to letting one’s spirit abide in emptiness and nothingness, to the ultimate center, abide one’s spirit in quiet peacefulness, with one’s full concentration. People’s mind has two components, one real and one reckless. Therefore those search for the real mind, does not arise reckless thoughts, this is real mind. Real mind’s personality is broad and bright, real mind’s place of abode is safe and at ease. Use the real mind to study the truth, one understand connections of thousand items; use the real mind to seek the Dao, one abide in the origin of ten thousand difference. Man to use this to interact with the world, have to nurture it and strengthen it, and abide in its peace and at ease, then one work without working, still and can respond (to the world). Alchemist said: when the mind runs away brings it back, brings it back and then let go, return to at ease after use, seek to be at ease then one realize. Who said one cannot be quiet in the middle of noisiness? Travel around and site dryly, is not the way to the Dao. Instead of travelling among cities and mountains, one should let energy travel among gates and holes throughout the body; instead of sitting dryly in cold hall, one should let spirit sit at the wonderful holes and locations. Building the foundation of Elixir is the basic of Dao seeking, when the foundation of Elixir is built, one can go home work and take care of the parents, be a productive member of home and society, then go back to mountain, find teacher and complete the great Dao. Those abandoning the family and wife, doing nothing but chanting and burning incense, are only deceivers making livings, not even worthy of discussion! Maintain the body is based on calming the heart and nurturing the kidneys; when the heart is calm the “li” fire does not burn outward, when the kidneys are nurtured the “kan” water does not leak outward. When fire does not burn outward, there is no sickness of shaken spirit, and the heart gets calmer; when water does not leak outward, there is no sickness of dried essence, and the kidneys get clearer. When the kidneys are clear the life fire does not rush upward, when the heart is calm the spirit fire can light downward, spirit and essence fuse and condense with each other, and can be used to heal diseases, then one has the condition to start real practice. When one is nurturing the spirit and energy, spirit is the master that collects energy. Collect one portion of energy one gets one portion of treasure; collect ten portions of energy one gets ten portions of treasure. The preciousness of energy, ten pounds of gold or jade cannot exchange one portion of energy, practitioner why compete for interest and gain? When interest is high anger and hatred arise, anger and hatred belongs to fire, energy is fuel for fire, when anger and hatred arise, energy goes away, energy goes away despite of one wanting to keep it. What is worse, mother and son fly away together. Therefore in nurturing energy it is important to abstain from anger and hatred, and to focus on nurturing the mind and spirit. Achievement and fame mostly occurred unexpectedly, therefore do not attach mind to money and abundance. Confucius said: “Learn, and money is in it.” Same is hold true for seeking the Dao, do not expect or greed for results. When meditate, must calm the mind and condense the spirit, do not hold any slight mind of speculation or expectation, just embrace internal breathing in practice. Refining the mind, start from small and eventually to bid. Now we are in hot weather, one bowl of rice is sufficient, do not seek for further full; one piece of coolness is sufficient, do not seek for further cool; few mosquitoes is ok, seek for mosquito free is not achievable. Start from tiny to big, right now is the place to refine the mind. Find sweetness in bitterness, find life in death, this is theory of Dao cultivation. The pathway to the Golden Elixir, although some say is easy to understand and difficult to practice, should not be proceeded blindly without seeking to understand. If the understanding is not proper, where is one proceeding to? If understanding is not thorough, how can one enter the right place? If the understanding is not in place, what is the use of spoken formula! Those learning the Dao, have to clear their mind and intent, in order to obtain the real and pure medicine. Do not indulge in acquired personality, do not run the thinking spirit, do not use the breathing air, do not use the biological essence. But when does the real essence moves, where does the real spirit arises, where does the real energy run, where does the real nature nurture, one needs to differentiate clearly from experienced person. When energy is wise spirit is pure, energy is the moment-by-moment surface of the spirit, how is it difficult to know? One only need to concern about the mind not being quiet. Collecting and inputting energy is the first most important step of practicing the Dao, if the mind is not quiet for careful contemplation, one will not know the end and the beginning, how can one proceed? Proceeding blindly and ignorantly, know this without know that, the mind is busy and busy, and there will be trivial mind appearing from time to time, and cannot be united, when the one mind is scattered into few pieces, how can one concentrate can practice? To learn the Dao one need to be sincere and focus, finish the enemy in one shoot, so to prevent future battle. When start meditating, one need to quiet both the mind and spirit, empty and silence, in state even ghost or god does not know. The kungfu is based on self examination and honesty, and eventually one obtains. What means to sincere one’s intent, is to not deceive oneself. Sincere in the center and manifest in the outer, therefore good student remain cautious when alone.